"In the illustrations, Subisak alternates Theo as a boy with Theo as a grizzly. She uses bold colors and varied lines to add movement and emphasis on the emotions and actions. Using the details and the shadows, she does an excellent job of showing the two sides: grizzly vs. human. " 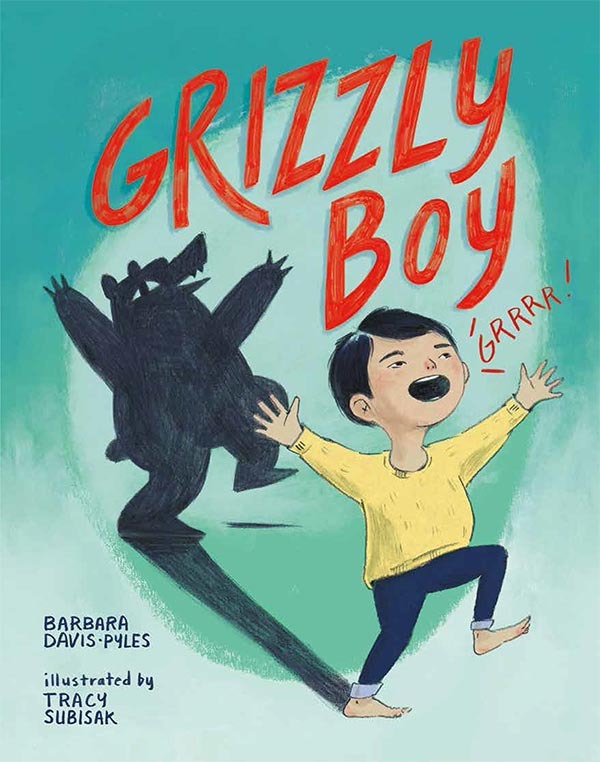 "Dueling art styles by Subisak (Shawn Loves Sharks) ramp up bear-vs.-human tension as printed text alternates with bold, hand-lettered speech balloons to represent Grizzly Boy’s powerful roars. She has fun with the background, too, imagining Theo’s surroundings shifting in and out of forest habitat, as when the staircase becomes a river with salmon leaping upstream. " "Manley's spare text is an excellent conductor for the dynamic energy built in Subisak's clean, open spreads as Shawn's passion for sharks spills onto the page. And as Shawn's fascination (and research skills) expands to embrace leopard seals, his exuberance for predators makes a surprisingly strong foundation for a new friendship. Fun, quirky obsessions nurtured and celebrated. " "Subisak’s vibrant, action-packed scenes feature a diverse cast of animated characters, lots of comical references to sharks hidden in the illustrations, and one over-the-top cat, which often gets caught up in Shawn’s shark games. The playful combination of thought-provoking narrative and dynamic artwork makes this a great icebreaker for conversations about bullying and friendship building." "This well-written, gentle tale with its colorful illustrations of the travails involved in being social will be a hit with shy kids generally, but the emphasis on eye contact and practicing various facial expressions before venturing into the big, alien world makes it especially right for children who are on the autism spectrum."